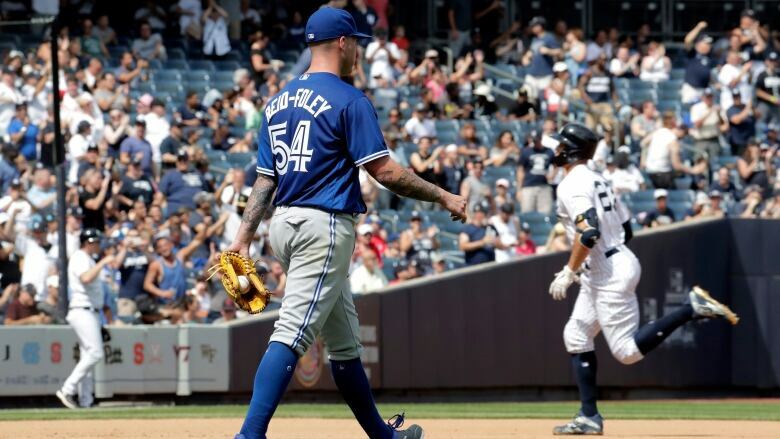 Giancarlo Stanton hit one of New York's four homers, Luis Severino struck out eight in five innings and the Yankees beat the Toronto Blue Jays 11-6 on Saturday. ​Another day, another big swing for Giancarlo Stanton. The 28-year-old Stanton got off to a slow start in his first year with New York after he was acquired in an off-season trade with Miami. He hit just .198 with four homers and 12 RBIs in his first 20 games. "I knew I had a big hole to dig out of," Stanton said. "But I don't ever doubt my craft or my work. Sometimes in this game, [it] takes longer than you expect or want." "There's a ton of talent," Toronto manager John Gibbons said of his young players. "They're just trying to harness it [and] put the whole game together."